publishing | ...Prepare to Die. TL;DR: One bad review is hurting my book sales. I need to make a comeback, so I’m offering free copies of my novel to anyone who will post an honest review on Amazon. To get your free e-book of my LGBT fantasy novel, click here and submit your request! I’ve seen this all the time from writing sites and author blogs that try to offer some comfort to authors who have received negative comments on their work on such sites as Amazon. “Don’t take it personal and just move on.” I’ve even seen a few articles that claim bad reviews can be a good thing–that they might have the curious effect of “boosting sales”, or they could contain good advice about what not to do with your next book. For the obviously trollish reviews, the best advice I’ve seen is “just ignore it.” (Removing an inappropriate review from a site like Amazon is notoriously hard, apparently, even if that review violates guidelines.) Obviously, I’ve received negative and mixed reviews before for my unpublished writing. I took what I could from those and moved on, as all the articles have recommended. But one thing I don’t see these writing sites discussing is what to do when you get a bad review, and have little to no reviews to balance it out. What do you do when one negative review impacts your sales so severely as to cause a virtual flat line? We’re talking about a kiss of financial death here, not just hurt feelings. I’m in one such position right now. Currently, Amazon is where I’m selling the most units of my first and latest release, Tributaries, which came out just a short month ago. My planning was a bit rushed. It was one of those live-and-learn experiences. I set aside just one short month for promotion before releasing the book. I sent free copies to dozens of blogs, made announcements on all my personal sites, advertised tirelessly on sites like Twitter and Tumblr, launched a Project Wonderful campaign, entered a Halloween book contest, and gave away ten free copies in a promotional raffle. I did manage to get some pre-orders, but naturally, one month is too short a time to generate any real buzz, so when my book came out, it was basically a blank slate. Anyone buying it was taking a risk on me as an unknown author. What all that meant was that any reviews I received from the incredible diverse (and often unprofessional) reading masses was going to determine my sales. Scary, right? Especially considering the trolls that haunt the internet. But for the most part, I got a handful of mostly good reviews, with one or two mixed reviews tossed in. The problem? Most of my positive feedback was on Goodreads, where people are known to add books to their lists and virtually forget about them. I’m guilty of this myself, having I think over a hundred books on my “to-read” list. And on Amazon, my primary seller? I managed to snag one glowing 5-star review one month after the book’s release. “That’s great!” I thought. Then three days ago, I got a scathing one-star review from a guy who said my book was “pointless” and who apparently didn’t think too much of my books “rare vocabulary.” He even took a shot at the fact that I have a bachelor’s degree, like I was trying to lord that over everyone. Ouch! And I could’ve ignored this review for what it was–the spiteful opinion of one guy who wasn’t even part of my targeted demographic. This was written by an older white man who has only bothered to review seven other books aside from mine, and only one out of those seven got four stars from him. A picky reader. Certainly not a crime, and it’s not like his review violated guidelines. But his scathing comments had a huge impact on my sales. The effect was almost immediate. He posted his review on December 17th. 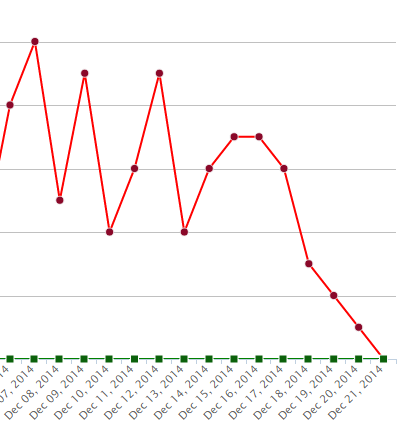 You wanna know what my sale chart looks like on Kindle Direct Publishing now? Ouch, ouch, ouch! What happened? Can one man’s negative comments really have such a devastating effect on an author? In my particular case…yes. You see, when you have such a small pool of reviews and a small publishing history to go with it, the fact of the matter is that unless I’m wowing people with tons of stellar reviews, no one is interested. It’s the insane hurdle that new indie writers have to overcome. This man’s one-star rating dropped my book’s average from five-stars to three. Even if I got another five-star rating, I’d only get half-a-star back of what I’d lost. Hardly the kind of thing that boosts confidence in potential customers, right? It’s particularly frustrating as I have a 4.2 star rating on Goodreads (at the time of this post) based on multiple reviews, but most of those who might actually purchase my book only ever see the feedback on Amazon. Talk about skewed perception! So the question is: how do I come back from this? The short answer? I honestly have no idea. Right now, all I can think to do is wait and have faith that someone who has already received the book will be kind enough to post a more positive review. What’s excruciating is that, until I get some better ratings to off-set this one bad rating, my sales will continue to look like the one above. I’ve already sent out free copies to tons of people prior to this latest set-back, specifically requesting a review on Amazon. I’d do a free sale if I was enrolled in Amazon’s Kindle Unlimited program, but I’m not. If this keeps up, I might have to resort to editing the base price to see if I can encourage more people to try the book. Over a hundred people have purchased it since its release, and I have no idea if any of them will bother to say anything about it–good or bad. And in the meantime? I guess I can just put my head between my knees and try to breathe. Publishing a book is rough, but it can be even rougher when one person sets out to destroy what little chances you already had. I don’t know that reviewers realize the kind of impact their comments have on writers like me. For me, this isn’t a hobby. I’m trying to make this my livelihood. The thing that hurts the most? It’s most likely that this person doesn’t give a damn about any of that. …All that said, for the next few weeks only, I’m offering my novel for free to anyone who is willing to post a review on Amazon. This is for an HONEST review, and you don’t have to feel pressured to write something positive just because of my woeful tale. I know my book isn’t perfect, I wrote the original manuscript when I was just 19 for heaven’s sake, and it’s my first attempt at writing a major novel. BUT I’ve also made significant improvements since then, and I’m confident my work isn’t a one-star affair. All you need to do to get your free copy of my book is go to the contact page of my book’s site by clicking here, and submit your request for a copy. After that, I’ll personally send you three formats of it: PDF, MOBI, and EPUB. I realize that any reviews posted on Amazon will have to state that you received the book for free, and that it won’t be a “verified purchase”, but anything is better than what I have right now. So I implore you. If you like independent books and/or LGBT fiction, then please consider reading my work and posting your feedback on Amazon! Don’t let this one person have the final say on what has taken over six years for me to accomplish! I’ll be doing this until the end of the first full week of January. (That’s the 10th.) Spread the word about this, even if you feel you can’t read the work yourself! Every little bit helps.